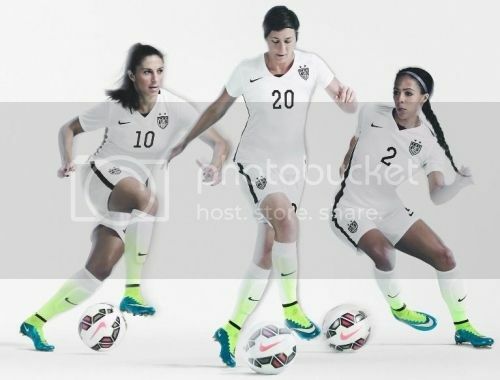 Here is a look at the kits the United States Women's soccer team will be wearing during the World Cup. 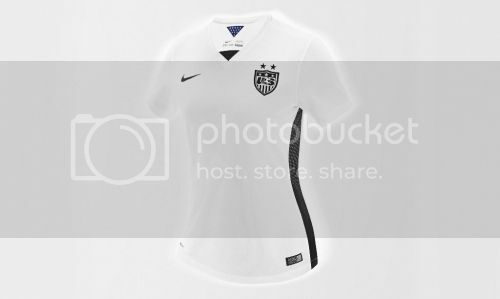 The U.S. Women’s National Team has unveiled a new Nike home kit the team will wear throughout the 2015 FIFA Women’s World Cup. The USA kits are available in women’s, men’s, and youth sizes and will be available for sale on ussoccerstore.com . Fans can also purchase the jerseys through the Nike Soccer App (gonike.me/SoccerApp), Nike stores and Nike.com. The new U.S. uniform combines fresh inspiration and modern style with the latest performance innovation and environmental sustainability. A black stripe runs down the side of the body, through the jersey and shorts, to accentuate player movement. A white-to-volt-yellow gradient in the socks draws the eye to the feet and the ball. Two stars stitched above the U.S. Soccer Federation crest proudly represent the USA’s two FIFA Women’s World Cup victories in 1991 and 1999, while a black triangular insert punctuates the new streamlined, modern V-neck collar. “The kit and boots feel great,” said Wambach. “If you look good, you are ready to play well, and when I wear this on the pitch, I feel inspired to play well for my country, our team, and the fans." For the first time, Nike has also created a pack of women’s footwear that includes all four of Nike’s cleat types – Mercurial, Magista, Hypervenom and Tiempo - in a stunning color combination designed in concert with the USWNT home uniform. The cleats combine flashes of volt yellow with a striking ‘Blue Lagoon’ color, a nod to the famous lakes of 2015 FIFA Women’s World Cup host nation Canada. The inside back of the neck features a blue triangular pennant design with 13 white stars, a numeric reference to the original U.S. colonies and a visual reference to the American flag. The names and numbers on the back of the shirt feature an angular, modern typeface that is a modern twist on traditional American collegiate-style graphics and designed specifically for U.S. Soccer. The kits are made from recycled plastic water bottles. The shorts are 100 percent recycled polyester; the shirts are 96 percent polyester, while the socks are 78 percent. They average a total of 18 recycled plastic bottles per uniform, while also lowering environmental impact. Nike Dri-FIT draws sweat away from the body to the exterior of the shirt and shorts where it quickly evaporates. Laser-cut ventilation side holes and strategic mesh paneling, including a full-mesh jersey back, help increase air circulation and thermoregulation. The U.S. Women’s National Team will be the first to don a bold new away kit that combines their strong sense of national pride with a stylish gradient design during the Algarve Cup in Portugal from March 4 to 11. The jersey prominently features two white stars above the team badge to represent the two World Cups that they have won - the first Women's World Cup in 1991 and their triumphant World Cup victory in 1999. “The new kit was designed to showcase the USA’s tremendous sense of national pride as well as their distinct sense of style, while also capturing the nation’s eternal optimism for achieving greatness,” said Martin Lotti, Creative Director for Nike Soccer. The U.S. Men’s National Team will wear the kit for the first time on March 25 in a friendly against Switzerland. The new away jersey has a distinct contemporary style, featuring a gradient graphic on the entire front and back of the shirt designed to creates a sense of continual movement. The graphic starts in white at the shoulders, gradually blending with a series of light rays before intensifying to deep blue at the hem. Along each side of the jersey is a wide white stripe, which extends to the shorts. When players are in motion, the stripe moves to accentuate the natural contours of their bodies and accentuate their speed. 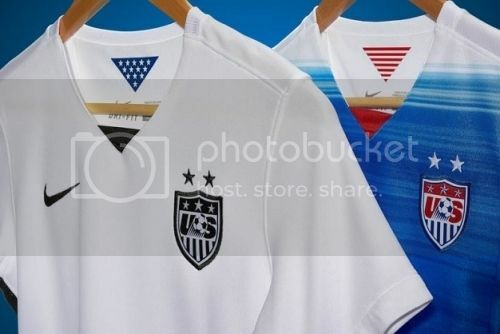 The jersey also boasts a new signature clean and modern V–neck collar that blends with the shirt’s gradient graphic, and features a red triangle insert at the front to ensure all three of the USA’s national colors are represented in the kit. Inside the back of the neck is a pennant tab featuring 13 red and white stripes to represent the original colonies that declared independence and formed the first states. Players' names and numbers on the back of the jersey appear in a unique, specially designed font that is modern, angular and directly influenced by U.S. college and varsity sports. The new away shorts are in dark blue with a white stripe along both sides to sync with the shirt. The women will wear a new gradient away sock that matches their jersey - dark blue with a wide tonal stripe of chevrons on the calf at the back. The men will wear a dark blue sock without the gradient design. While the new kit features Nike’s signature style and passion, it has also been designed to offer players the very latest in performance innovation, kit technology and environmental sustainability. Nike took 3-D body scans of many of the world's leading soccer players to create a kit with the perfect fit. The fit allows the body to move more naturally within the kit to effortlessly improve players' comfort and performance. The Nike Elite Match fit sock also boasts a sleek design created especially for soccer. Nike's designers gathered insights from many of today's elite players to pinpoint what they want from a sock during a game. Strategically cushioned zones help provide comfort and protection around the big toe and the anklebones where the majority of impact occurs, while arch support provides a firm foundation for the foot to prevent slipping. The sock features less material to enhance players' touch, while flex grooves on the ankle and top of the foot prevent bunching. Nike continues to place environmental sustainability at the heart of their kits, which are made of polyester derived from recycled plastic bottles. The kits have been created to provide both unrivalled performance benefits and a lower environmental impact. The kits are made from recycled plastic water bottles. The shorts are 100 percent recycled polyester; the shirts are 96 percent polyester, while the socks are 78 percent. By using recycled polyester Nike is also reducing the energy consumed in the entire process by up to 30 percent. Also, each kit is made using an average of 18 recycled plastic bottles, a process that has diverted more than 2 billion bottles from landfill since 2010. Nike Dri-FIT technology draws sweat away from the body to the exterior of the jersey and short where it can quickly evaporate. This allows players to perform at their absolute best by remaining cooler, drier, and more comfortable. The laser-cut ventilation holes and mesh panels featured in key areas of the kit also improve performance by increasing air circulation to the players' bodies, helping to regulating their body temperature. The blue kits are cool. The white ones are kind of bland but it seems like they will help the players keep cool during the matches.